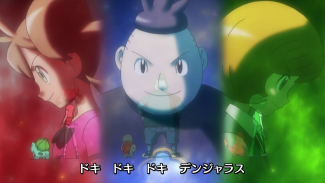 "Mega V (Mega Volt)" (メガV (メガボルト)) debuted as the ending theme to the Pocket Monsters XY TV Special "The Greatest Mega Evolution ~ Act I ~." It was later brought back as the second opening theme to the Pocket Monsters XY TV series and will be used as the opening theme to Pokemon the Movie XY The Cocoon of Destruction and Diancie. It is sung by Yuusuke. Used in XY 028 - XY ?? ?, Pocket Monsters XY Special "The Greatest Mega Evolution ~ Act I ~", Pokemon the Movie XY "The Cocoon of Destruction and Diancie"
So, why don't I gather up my courage and set out to be better than the me from yesterday?